In 2015 Adam Sultan ran 15 marathons. It was part of a project he created called #LifeYears aimed at making every single year of his life memorable and unique. 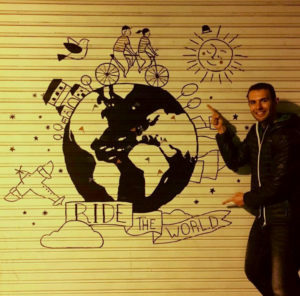 In 2016, Adam is setting out on a new challenge and multi-year cycling adventure called #RideTheWorld. After years of working in a job that wasn’t satisfying, Adam has devoted himself to living a purposeful life pursuing adventure and sport. While cycling, Adam plans to participate in Citizen Science and fundraise for several charities including SEED Madagascar which does humanitarian and conservation work in one of the poorest countries on the planet. You can learn more about Adam at his website adamtsultan.com. Adam Sultan, welcome to The Pursuit Zone.